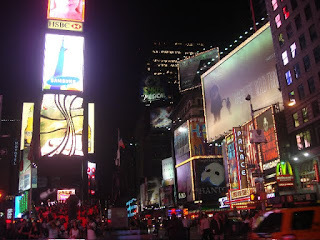 I just returned from a whirlwind trip to New York City for the launch of the Ninja Master Prep. The organizers of the event were kind enough to extend my return so I could visit my relatives in New Jersey. It was a lot of fun, even though I missed the kiddos an awful lot. 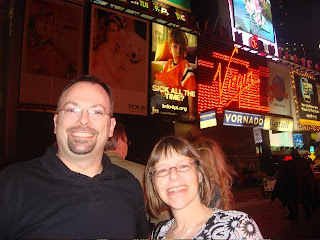 I got in late on Wednesday night but managed to meet up with some other bloggers and take a stroll through Times Square with Kim and Drew. 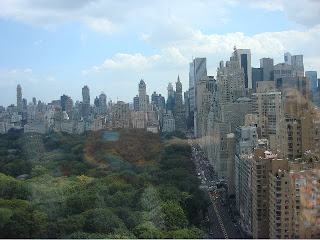 The Ninja launch was at the Mandarin Oriental, which has to rank as one of the most stunning hotels I've ever seen. 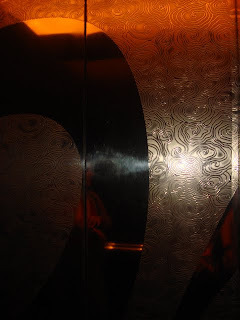 Even the elevator doors were beautiful! I'm surprised that I didn't whip out a camera to take pictures of the lobby bathrooms, but luckily Kristin took some that you can see here. 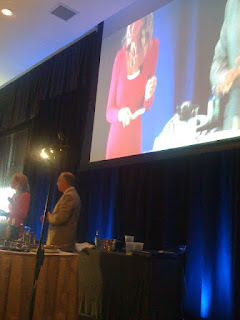 Since this was my first real blog event, I think I was flustered at the concept of taking photos AND paying attention. Check out the iPhone pictures I took during the presentation. Nice, right? Not! Robin Miller and Euro-Pro CEO Dann Provolo were funny and engaging while showcasing the many uses of the Ninja Master Prep. Both used plenty of personal experiences about parenting and cooking. I was a little worried that the product might be sketchy since it's about to go on the infomercial circuit but I was relieved to see that it is, indeed, more than just another blender. 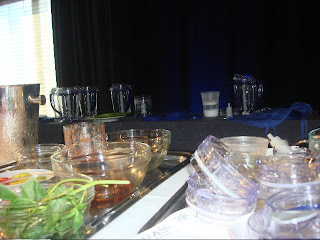 Ninja Master Prep was pitted against a high-end blender (Cuisinart, if you must know…) in an ice-chopping contest and you could hear the gasps in the blogger-filled audience as the blender stalled while the Ninja produced SNOW. Seriously- powdery, finely crushed ice which Robin proceeded to make into slushy mojitos and mock frappucinos. She suggested freezing leftover coffee into ice cube trays to make an even stronger coffee drink. Good idea! Being skeptical bloggers, there were quite a few questions about the plastic that the Ninja vessels are made of. Apparently it is made of SAN, a non-polycarbonate plastic that is BPA-free and dishwasher/freezer/microwave safe. It won't craze and it is break-resistant and shatterproof. The Ninja comes with a pitcher base and a cylinder base and lids to cover them with and the local NY bloggers were happy to hear that it all stacks together to take up less storage space. Another thing to note is that the Ninja Master Prep has a lifetime guarantee that includes blades, motor, etc. Robin made us so hungry, preparing Tortilla-Crusted Salmon with Tropical Fruit Salsa, Miso Mushroom Soup with Udon Noodles, Curried Cashew Chicken Salad on Toasted Raisin Bread, Mango-Habanero Pork over Cuban Guacamole, Blueberry-Cranberry Sorbet and Raspberry-Orange Sherbet. 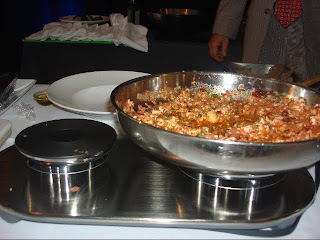 The one that really got my mouth watering, though, was her Chicken Fra Diavolo which smelled amazing and literally took seconds to assemble with the Ninja Master Prep. After Robin's demo, we were treated to hands-on demonstrations of the Ninja Master Prep and Euro-Pro's amazing Shark cleaning appliances. I can't wait to try these at home so I can tell you more about them! I am especially excited about the Steam Cleaners, which use water and heat to disinfect surfaces in your home instead of harsh chemicals. 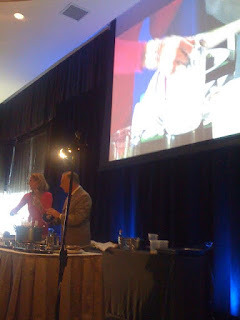 After the product demonstrations, there was an amazing buffet featuring all of the recipes that Robin had prepared for us using the Ninja Master Prep. The food was amazing. I especially enjoyed the pork and the black bean hummus. 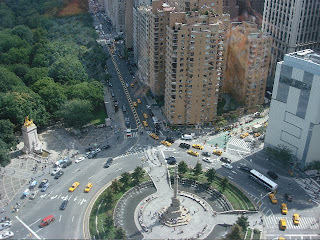 The view was just amazing, looking out over Columbus Circle and Central Park. One thing that amused us was the fact that the catering crew obviously didn't use the Ninja Master Prep to make their frozen mojitos because the ice was too chunky… It was great having some time to mingle with some bloggy friends I hadn't seen since BlogHer and to meet new friends but I wish we'd had a little longer together. We all went our separate ways and I got to hook up with my aunt and cousin for dinner and a show before heading back to New Jersey to spend the weekend with my grandpa. Thanks to Euro-Pro for a great trip! I look forward to telling my readers more about the Ninja Master Prep and Shark cleaning appliances as soon as I have a chance to try them out at home. Wow, sounds like a great trip! I am so curious to see the Ninja Master as we have a Cuisinart and we LOVE it! If the Ninja Master is better, then we'd be in heaven!! And big "AW!" when I saw the pic with you and your grandpa! So sweet! I miss my grandparents (they've been on a missionary trip all summer!). Glad you got to visit your family too, but I KNOW you're glad to be back with your dh and kiddos! What a fun trip. Oh, wait, I was there, too. You should put your photos in a Whrrl story. It'd fun to see them all together like that. Cute grandpa and family. What's that about taking pictures in the bathroom? Look for my next Whrrl story....soon! What a fabulous trip! I'm so glad I got to see you and meet Kim. I really want some of that chicken salad. The curry..yum. I am glad you had a nice trip! I absolutely love the Shark Steam Mop! I bought it after K3 was born. It rocks! I was so happy to meet with you, even though we did get lost. Grrr. Hey, my stuff came today - did you get yours? Oh hey, that's me up there! It was great meeting you. Hopefully we'll have longer to wander around next time someone wants to show us new stuff. Wow! This sounds like lots of fun and how exciting to have everything covered and also see some family.